Both a man convicted of murder and his victim’s mother were overcome with relief when it was recommended he be released from a detention centre to live as a free man. But two weeks after the news from the Australian Administrative Tribunal (AAT) – and despite a tireless campaign to stop his deportation – Mark Basa feels no closer to walking out of Villawood Detention Centre. The Department of Immigration could still take at least six months to a make a recommendation on his visa. “We all thought it was over but now I am starting to get a bit nervous,” Basa told nine.com.au from inside his cell at Villawood. The AAT recommended the Papua New Guinea (PNG) born refugee be granted a protection visa as he would face risk of death due to tribal warfare and medical complications if he were to return. Basa was told he needs to undergo a medical examination that includes a chest x-ray for the department’s consideration, but an “uneasy feeling” washed over him later that day when he was told it had already been completed. Basa has already spent six months in detention after the Department of Home Affairs moved to deport him when he was paroled in January. His conviction meant he was considered “of bad character”. Basa was in jail for 12-and-a-half years for the brutal murder of Zane McCready. Mr McCready was beaten with a bike chain, stomped on and had his throat slashed when a group of about 15 football mates from the Waratah Mayfield Cheetahs set upon him in the streets of Newcastle in 2006. Only Basa faced charges for the gang attack. He pleaded not guilty. “The word ‘cheetah’ was called out before Zane was killed. [The judge] said it in court; they were calling for a fight and my son was killed in the name of Cheetah,” Zane’s mother Ros Lowe told nine.com.au. 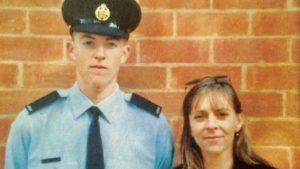 Despite the viciousness of the 20-year-old Air Force cadet’s death, his mother has fought for Basa to remain in the country. She knows Basa is the key to a judicial review into her son’s death. Ms Lowe has waited 13 years to be able to look Basa in the eye as he explains what happened on the night of the gang brawl, and was initially overjoyed when she found out about the AAT’s decision. “It is such a big relief for me; I’ve always known his story was never told and now I will get to sit and talk to him. I am so happy,” Ms Lowe told nine.com.au. Ms Lowe has long argued Basa’s conviction was a “miscarriage of justice” and said he alone should have never been found guilty of murdering her son. Less than a week after the anniversary of her son’s death, Ms Lowe still feels the “cruelty” of leaving Basa in detention for months on end, wondering if he will ever be reunited with his family. “It’s mental abuse, like torture, for him and his family,” she said. Basa has always maintained his innocence and claimed his conviction was a “cover up”. Ms Lowe supports that theory and has demanded police reinvestigate the case. When Basa found out about the AAT’s decision, he struggled to articulate how he felt. The young man had only just returned from visitation where he celebrated his 29th birthday with his father Richard – who fled PNG with his family after receiving death threats due to his position as a tribal leader – when he found out about the a fax from AAT. “I was so hesitant to read it so I made a coffee and braced myself for the worst but the result was just surreal,” he said. Basa instantly phoned his father who was “ecstatic” to find out his son was one step closer to freedom. “He just kept saying, ’13 years, after 13 years my battle is finally over’,” Basa said. As soon as the 29-year-old is released, he wants to speak with the parole board about making contact with Ms Lowe through a Restorative Justice program. The AAT found there was a “real risk” Basa would face “significant harm” due to his father’s opposition of forestry operations in his community. Basa earlier told nine.com.au he had no family to protect him in PNG and would likely live “in the streets”. The AAT also acknowledged Basa would have faced another life-threatening hurdle if he was deported. He had a third of his pancreas removed while he was in jail and depends on daily medication to survive. Basa’s family were granted protection visas and Australian citizenship while he was incarcerated. The AAT have urged the Department of Home Affairs to reconsider granting Basa a visa but it now must consider if he would pass a character test. Under section 501 of the Migration Act 1958, it can refuse a visa if an applicant has history of “serious criminal offending”. A spokesperson for the Department of Home Affairs said matters considered following a review at the AAT must undergo a mandatory health, character and security check before a visa will be granted. “The Australian Government takes its responsibility to protect the Australian community from non-citizens who pose a threat and/or cause harm to the Australian community very seriously,” a spokesperson told nine.com.au. Basa’s lawyer, Jason Donnelly, said the Department does not look favourably on people who have committed a serious crime. “There is one benefit in his case, despite the significance of his crime, the victim’s family don’t wish for him to be deported,” Mr Donnelly told nine.com.au.